the other side we made our companies adopt the Lean philosophy on a wider scale. 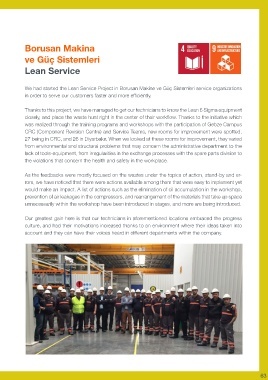 reduced the waste drastically with the improvements made under Lean Service Project implemented   in order to serve our customers faster and more efficiently. in Borusan Makine ve Güç Sistemleri. In Supsan, in order to focus on the career development of the factory workers, the “Lead-  the violations that concern the health and safety in the workplace. Thus, the efficiency values increased continuously, making the production costs globally com-  unnecessarily within the workshop have been introduced in stages, and more are being introduced. account and they can have their voices heard in different departments within the company. products planned for introduction in the upcoming years.